The luscious leaves of collard greens look as good as they taste! Easy and versatile, collards have graced Southern gardens and tables for generations. A cousin to kale and cabbage, these nutritious, leafy greens thrive in the cooler weather of fall and early spring. 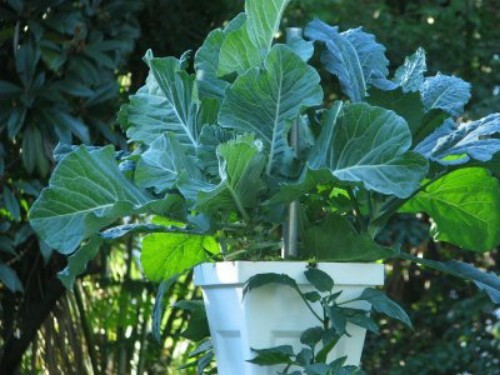 Plant: Depending on where you live, you can plant collards in late summer and early fall. Use a large enough garden planter that they have room to root up! The love growing in garden containers, so use any large planter that you have or treat yourself to a new colorful style from Arizona Pottery. Some favorites are "Champion", "Blue Max" and "Vates". Nuture: Collards like to be fed. Choose a fertilizer high in nitrogen because you are encouraging leaf growth not flowers! Water regularly and deter collard loving caterpillars, especially in spring, with a insecticide. Harvest: Use a small knife or clippers to cut the entire plant about 4" from the soil. The plant will send new leaves from the remaining stem. You can also pop off single leaves by hand, starting from the bottom. Wash well before cooking. Read more.....Considering climates when planting.